Canadian Pastor Kicks Out Gay Youth Volunteer Because Parents Might Be "Uncomfortable"
Colin Briggs, 20, has volunteered at the church since 2011. He also worked as a camp counselor for two years. 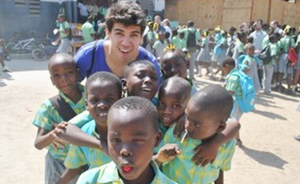 During his last year of high school in 2011, he joined a mission to Haiti. Pastor Mark Brewer asked Briggs to stop by the church on September 18 for a meeting. The youth pastor, Nathalie Estey, was also present. To his shock, they asked Briggs to stop his volunteer activities. They said he was welcome to continue attending church services. Well, at least he’s welcome to attend services — and, no doubt, make donations. Actually, it would make me far more uncomfortable having an openly christian person interacting with my children.